The West Coast, or ‘the Coast’ as locals call it, is a wild place of rivers and rainforests, glaciers and geological treasures. Never more than fifty kilometres wide, in the whole stretch of it down the coast of the South Island there are only 31,000 people. The ‘coasters’ (as the locals are known) are a bunch of independent, self-reliant but hugely friendly and hospitable people. Sit down and have a beer with them and they’ll regale you with West Coast stories. The West Coast, also, is New Zealand’s only source of greenstone (pounamu) with the boulders being found in the West Coast rivers. Greenstone carvers and other artists work in Hokitika and Greymouth. The pancake rocks and blowholes at Punakaiki are among the West Coast’s most famous sights. The Franz Josef and Fox glaciers, giant rivers of ice have squeezed down the valleys to just 250 metres above sea level. Visit the 100% PURE NZ website for more information about the West Coast - and the rest of New Zealand. I sure am, and my partner has cycled all over New Zealand. In 2012 I cycled the Otago Rail Trial with my Dad. 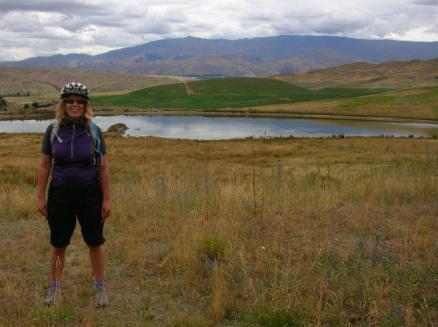 This trail takes you through the breathtaking scenery of Central Otago. The West Coast Wilderness Cycle Trial runs past our place!